The Stroke Association today launches a new initiative to help more people affected by stroke receive emergency medical treatment. 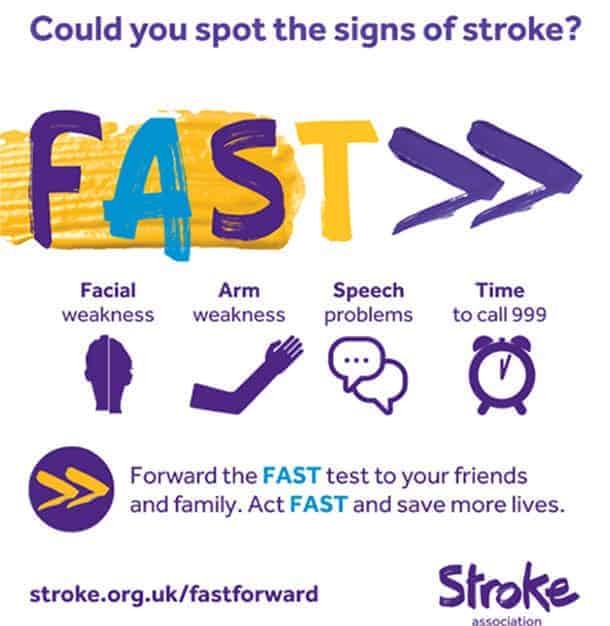 The charity is calling for people across the South of England to support the FAST Forward campaign by learning the signs of a stroke and sharing the message to help save more lives. Simon Batsman, 20, from Winchester in the South of England had a Transient Ischemic Attack (TIA) otherwise known as a mini-stroke, in February 2013 and believes the FAST Test could have saved his life. Simon was in his first year at University and went to the fridge to get some milk but collapsed before he got there. He was weak down one side and his speech was affected. His housemate recognised the Arms and Speech symptoms from the FAST adverts so called an ambulance. Thanks to the quick response from his housemates Simon spent just a few days in hospital. Katherine Staley, Regional Head of Operations for the Stroke Association in the South of England said: “When it comes to a stroke or TIA, time lost is brain lost.A stroke is caused by a blockage or a bleed in the brain, which cuts off the brain’s flow of oxygen and causes brain cells to die. So recognising the symptoms of stroke and calling 999 for an ambulance as quickly as possible is absolutely vital. Acting FAST can help reduce the devastating impact a stroke can have. To find out more about the FAST Forward campaign, and to view information and support available, visit www.stroke.org.uk/FastForward.